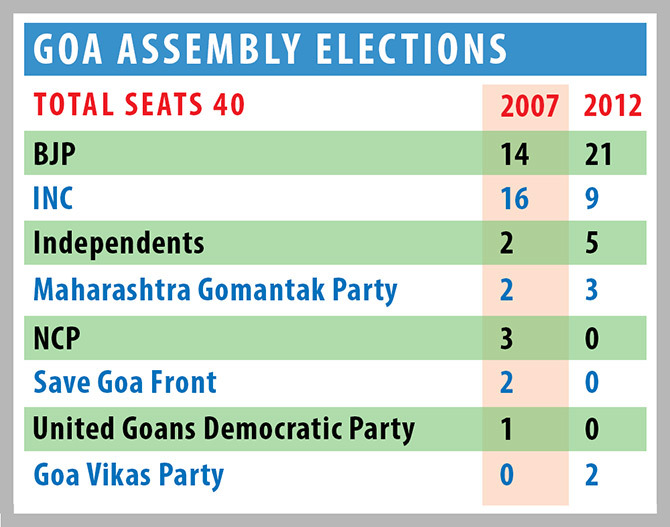 Rediff.com » News » Look how many parties are contesting the Goa poll! 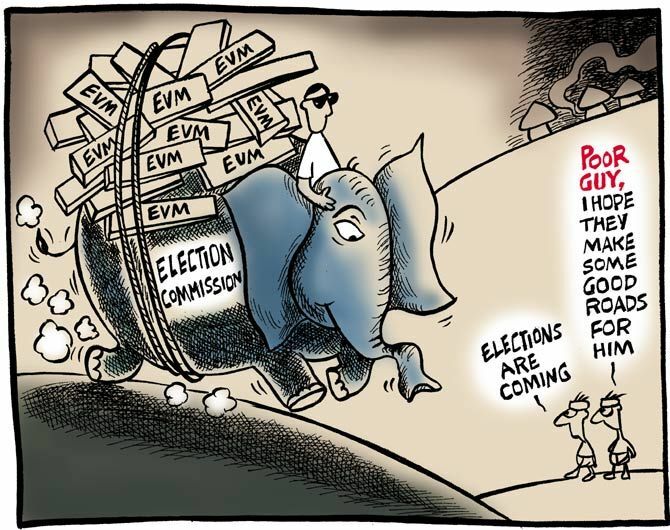 Look how many parties are contesting the Goa poll! A potpourri of political parties are in the fray in Goa. India's Sunshine State elects a new government on February 4. Aam Aadmi Party, Bharatiya Janata Party, Congress, Goa Forward, Goa Suraksha Manch, Maharashtrawadi Gomantak Party, Shiv Sena candidates are contestesting the 40 seats in the state assembly. Defence Minister Manohar Parrikar, a former chief minister (March 2012 to November 2014), has led the BJP charge, completely overshadowing his party colleague, Chief Minister Laxmikant Parsekar. Parrikar has addressed more then 30 Vijay Sankalp rallies across Goa, and there is talk that he will abandon his office in New Delhi's South Block after the election for a perch in the state secretariat in Panaji. Not surprisingly, the Congress campaign is in some disarray with Congress General Secretary Digvijaya Singh -- the man who calls the party's shots in Goa -- at loggerheads with state Congress boss Luizinho Faleiro. The disagreement is over the number of seats the Congress will contest. After declaring it would contest 36 seats, leaving four for its ally, Goa Forward, the Congress has now fielded 37 candidates including a nominee for the Fatorda seat, which it had left for Goa Forward mentor Vijay Sardesai earlier. Another Congress ally, the Nationalist Congress Party, is contesting the election separately and has announced a roster of 18 candidates. The Maharashtrawadi Gomantak Party, a BJP ally, is flying solo too. The MGP has fielded 26 candidates, the other seats will be contested by its partners, the Shiv Sena and the Goa Suraksha Manch, which is led by Subhash Velingkar, a Rashtriya Swayamsevak Sangh rebel. The Aam Aadmi Party, a debutante in Goa politics, is projecting Elvis Gomes, a former inspector general of police, as its chief ministerial candidate. The AAP is leading a typical high decibel campaign, promising to cleanse Goa's very murky politics. IMAGE: The map shows the constituency-wise victors in 2012. In 2012, the Parrikar-led BJP easily defeated then chief minister Digambar Kamat's Congress coalition. The BJP-MGP alliance won 24 seats (BJP: 21. MGP: 3). The Congress suffered a drubbing, winning just 9 seats. Independents won 5 seats while the Goa Vikas Party bagged 2 seats. After the 2007 assembly election, the Congress formed the government with the support of the NCP and the Save Goa Front. The Congress won 16 of the 32 seats it contested; the NCP and SGF won 3 and 2 seats respectively. The BJP won 14 of the 33 seats it contested in 2007. In 2007, the BJP polled 30.32% votes; the Congress won 32.25% votes. In 2012, the BJP increased its vote share to 34.68%; the Congress' vote share fell to 30.78%. Independents and other parties had a 37.43% vote share in 2007; this declined to 34.54% in the 2012 election. Women constitute about 49.32 per cent of Goa's population. The state is also seen as being progressive and women-friendly, has a high literacy rate and per capita income among women. For a state once ruled by a woman chief minister -- Shashikala Kakodkar, whose father Dayanand Bandodkar was the first chief minister -- Goa elected just one women to the assembly in 2012. Jennifer A Monserrate, the Congress MLA from Taleigao, was later joined by the BJP's Alina Saldanha who won a by-election after her husband, Jose Matanhy de Saldanha, a sitting MLA, died. Four women were elected MLAs in the 1994 election -- Kakodkar of the MGP, Congresswomen Sangeeta Parab and Fatima D'Sa and Victoria Fernandes Romeo, an Independent. Mrs Kakodkar -- whose brother Siddharth Bandodkar was once married to actress Leena Chandavarkar; he died mysteriously -- will not contest this election. She passed into the ages last October.